I don’t often blog about the serious stuff here mostly because a society is just so complicated that it’s really difficult to sum something up in a 500-word blog post. It’s hard to write something that doesn’t come across as judgmental and stereotypical and most of all, I don’t want to offend anyone however, these are my experiences, good and bad, and my take on what I see and experience. As I wrote my last post, things were frantic here. No one knew what was happening or why it was happening. Rumours were flying, people were panicking, it just wasn’t good all around and I can’t say that things are a whole lot better. Everything is so ill communicated here and even when they are communicated, they rarely make sense. When you do find out information, you wonder if you can believe it and worry that things could change quickly and turn volatile. The biggest fear is that we really have no defense here. Corruption is rampant; they change & make rules to suit their own benefit and it’s near impossible to defend yourself if they charge you with something. It can be quite scary and you want to do everything to make sure you don’t come under fire for anything. The checkstops continue and the police continue to ‘visit’ the bases of international companies to conduct their investigation. Some days they are looking for one thing, others it’s another. Originally, they were only looking at the men and the few women who work here but yesterday, the police went in to the supermarket and began questioning women. I’ve heard of a few people being asked to leave within 72 hours and others have been allowed to stay while their name remains on a list. Some have been advised not to leave as they may not be allowed to re-enter. We were all let in to this country. We didn’t illegally cross the border or pull up in a fishing boat seeking refuge in Gabon. All of us have visas or residence cards and we’ve all passed through immigration numerous times in and out of the country. We go through the lengthy process of acquiring a residence card and then go through the lengthy process of getting exit and entry visas just to travel. Each time the Gabonese government approves us. If they don’t want us here, they shouldn’t approve our entry. The majority of international companies try very hard to tow the line of immigration as that is something they really don’t want to have issues with down the road. It can really hamper their business and relationship with the country. When the government decides that all foreigners need new documents, the companies try to get those papers as soon as possible to avoid future problems. In this case, most companies have submitted applications for the newly required work permit but the government currently isn’t issuing them – even though they are required. I've heard that those without the permit will be fined 1.2 million cfa ($2400) even if they've previously applied for it. There is a trail of paperwork a mile long about every expat here. I can’t count how many applications I’ve submitted for visas alone not to mention the numerous passport photos I’ve had to get for those applications. Where does it all go? Why is it necessary that they pull every expat into the immigration office and copy it all out by hand from our passports? Just a few weeks ago, the Gabonese government and a large international company hosted a large gala in Libreville spending thousands upon thousands of dollars to showcase a new special economic zone in Gabon. Propaganda is all over the place and the government continues to stress that they welcome new industry and new companies to Gabon. They continue to tout Gabon as an internationally friendly place to invest when those that are here aren’t feeling very welcome. We are well aware that we are guests in another country. We follow their laws and customs and even though we may complain here and there, many of us are happy to have the opportunity to learn about life outside of our own bubbles. We accept that things are different and we respect that hoping that we are respected in return. This week we have not felt respected. Gabon doesn’t exist without corruption; it’s on every street corner, in every office, in the markets and on the road. Some days you hardly notice it whereas others, it hits you right in the face. This week has been one where it hits us in the face. It’s not unusual to have police checkstops here. There are locations where they are more common and they’re sporadically throughout the month and on weekends. Often times, they’ll ask for your car papers and let you go. Other times they’ll find problems with your papers and try to give you a fine on the spot. (We are advised not to pay on the spot as the officers will take the money for themselves. Instead, we are to ask to go to the police station where they can actually write you a receipt. Sometimes they’ll advise you to go there, other times they’ll just let you go.) It can get difficult because they often change the rules and even if you have everything in order, it might not be enough for that particular officer. Monday morning we noticed an unusually large number of police officers and checkstops and as I met my friends for our morning walk, I heard of troubles they had over the weekend, mainly, police confiscating their passport or residence cards. Rumour has it that the petroleum workers’ union is unhappy again. In short, they want us gone and they want the jobs for themselves. (They don’t seem to realize that we are here for a reason. Expats are brought into countries when the locals aren’t qualified to do the job and if they force the expats to leave, the foreign companies will also have to leave and they will be without jobs.) Apparently, the union asked the police for help to find foreigners to deport. Monday afternoon the police began going to foreign offices, Halliburton being one of them. They went for a meeting with the base manager and locked the gates not allowing any expats to leave. They began by rounding up a group of employees, Joe included, and eventually decided to take everyone to the immigration office. At the immigration office they took a record of everyone’s documents. Joe was there for about 4 hours and he said it was not hostile in the least but very inefficient. When we first arrived in Gabon, all we needed was a valid visa or the carte de sejour. They’ve now changed their mind and have said that all foreign workers need a work permit separate from the residence card. People began applying for the permit but the government won’t issue them at this time leaving the majority of expats here without the document. It seems like this crackdown has to do with the permit and the union is hoping to have everyone deported that doesn’t have it. We are currently dealing with police checkstops on every corner, one officer in the driver’s side window asking for papers, another in the passenger window asking for money. Yesterday it was just papers, today they are apparently trying to fine people for not having a fire extinguisher in the car (not previously required.) The police are still making their rounds to all companies and will continue to do so all week. As far as Halliburton is concerned, nothing has been hostile and no one has been deported. Other companies haven’t been as lucky. I heard of 2 men being deported from one company and my friend’s husband must leave the country temporarily tonight leaving her and their 3 kids behind. Joe has all of his papers, work permit included, but many of our friends do not. There is an uneasy feeling among the expats here. We don’t particularly want to go out as we don’t want to be hassled by the police yet it’s hard to not go about your daily life. While I’m pretty confident Joe & I won’t be deported, which might not be a good thing, the uncertainty of everything else isn’t fun. We are not happy with how we are being treated and we certainly feel the irony of the president touting Gabon as a great place to invest and that foreigners (and their money) are welcome. Please note, like any post I do, it’s from my own experiences or experiences of friends of mine and there could be inaccuracies. It was a huge surprise when I received a message from an old friend of Joe & I’s who happened to be boarding a flight to Singapore. Joe & I met Nao the same time we met each other, our first day of university on 1Mac. Nao is Japanese and he completed his business degree in Canada and returned to Tokyo to begin what has become a very successful career at Goldman Sachs. We, nor anyone else from 1Mac, heard very much from Nao since then – we knew that he was working like crazy but always wondered about him. 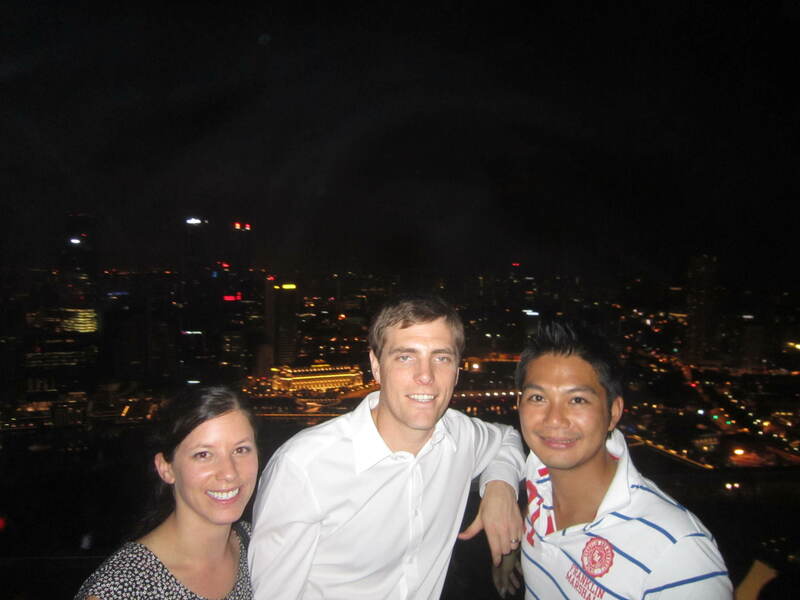 Joe, Nao & I on the top of the Marina Bay Sands hotel. I’m not exaggerating when I say that Singapore’s national past time is shopping. I have never seen so many malls in my life and these aren’t just mini strip malls with a bunch of dollar stores – these are high end, luxurious malls. Any designer store you could dream of was there, and multiple times: Louis Vuitton, Prada, Dolce & Gabbana, Miu Miu, Christian Louboutin, Cartier, Gucci, and many, many more. 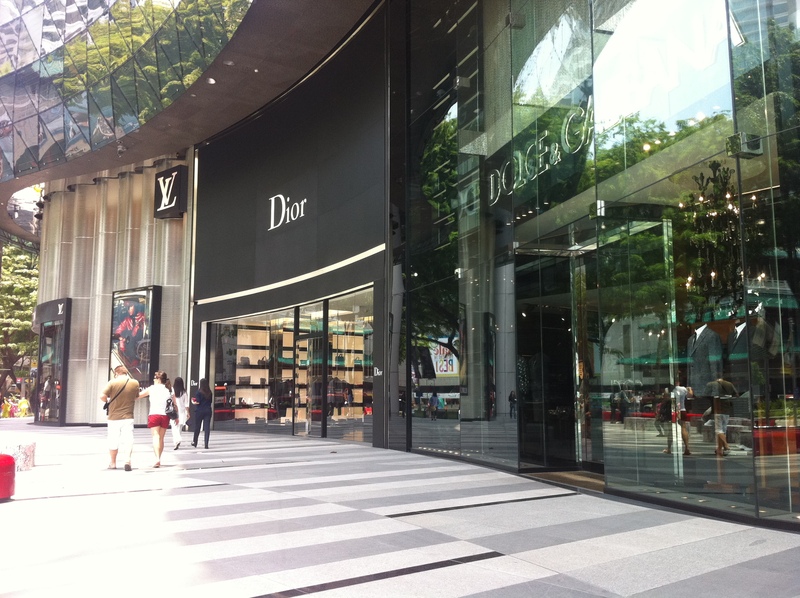 Just when I thought I found the largest LV store I’d ever seen, I crossed the street and found another. I have never seen anything like it, not even in Los Angeles. When Joe was in his course, I spent my time window-shopping and daydreaming. I tried very hard to reason myself into going on a luxury shopping spree but reality hit – I live in Africa, what do I need from Prada??? My fingers are crossed so tightly for our next location – please let it be somewhere I can bring my Jimmy Choos! 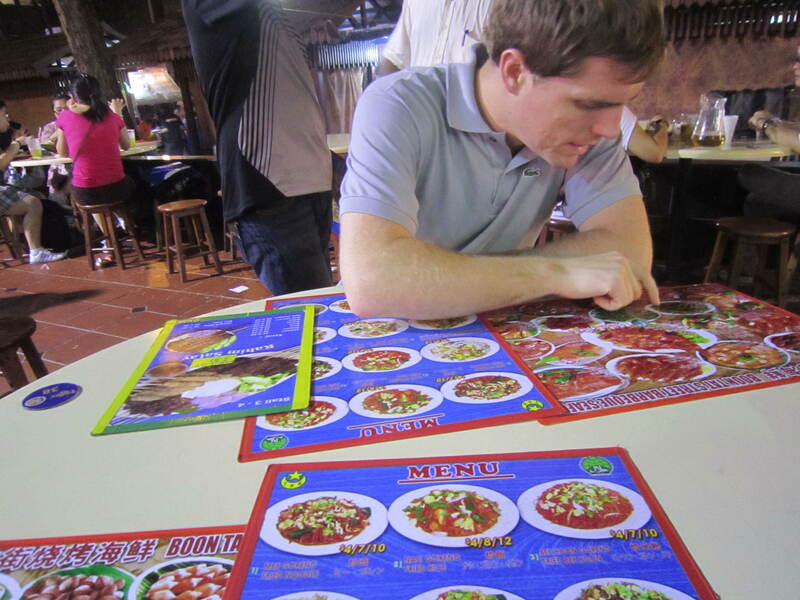 Joe pondering menus at a street market. The only downside to all of this was how expensive it was. Sure, the street hawkers were reasonable but alcohol sure wasn’t! To buy a can of beer (local beer at that) in 7-11 was $10. In a restaurant, the cheapest we saw was $13. My pomegranate martini at dinner one night cost $26 (it was so good it was worth it.) I suppose you get used to it – just as we’ve become accustomed to $25 broccoli! 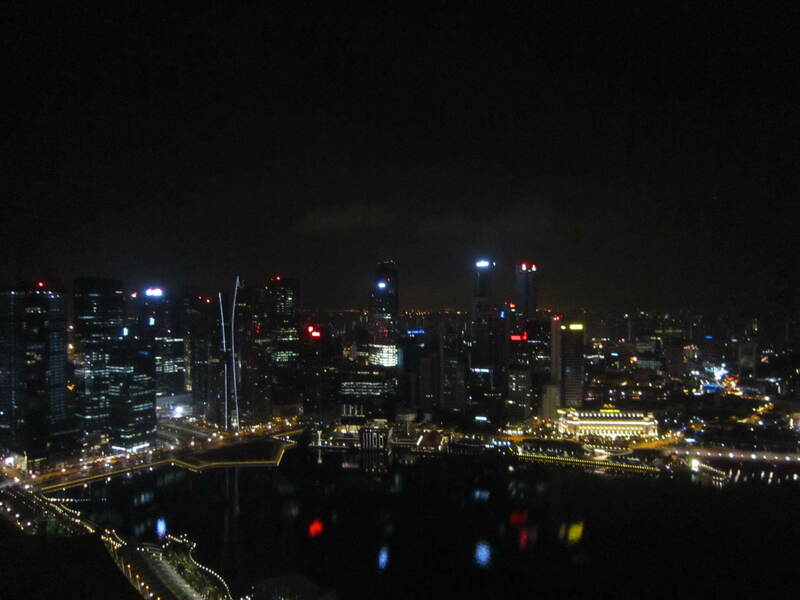 Singapore has got some tall buildings and numerous of rooftop bars & restaurants. We started our exploration of heights with the Singapore Flyer, a giant observation wheel. 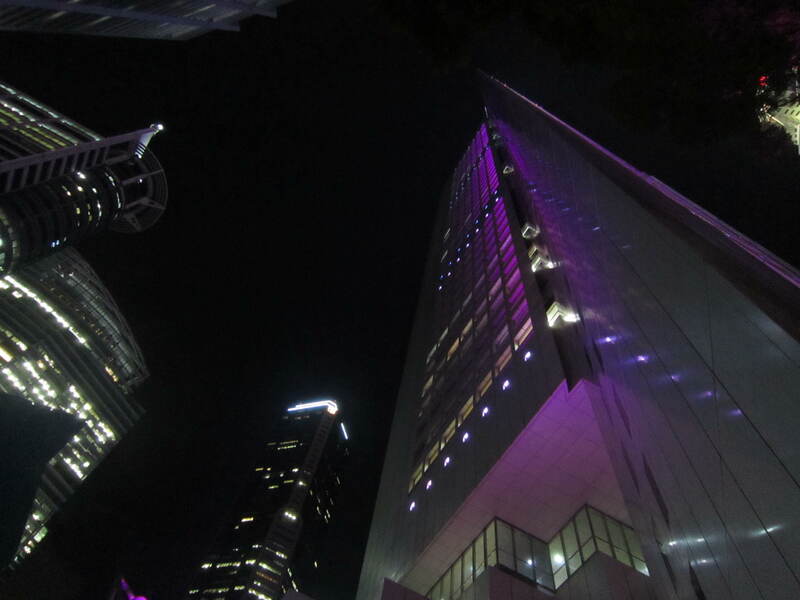 We then ventured much higher to One Raffles Place where we took an elevator to the 62nd floor, a whopping 282 m high for a drink (or 2) at a bar fittingly called, Altitude. There was a glass railing around the perimeter no taller than me, no wire or mesh above that so I could peer over the railing to the ground below – freaky, but beautiful views of the city! 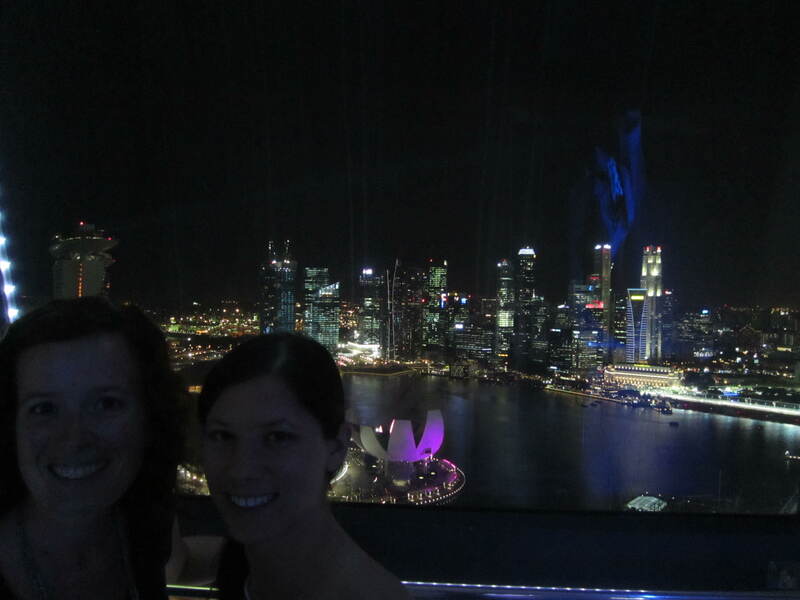 Jeanie & I on the Singapore Flyer. Going up? Heading to Altitude, all the way up there! The Singapore Flyer on the left and Marina Bay Sands in the centre - both quite a bit smaller than where we were! 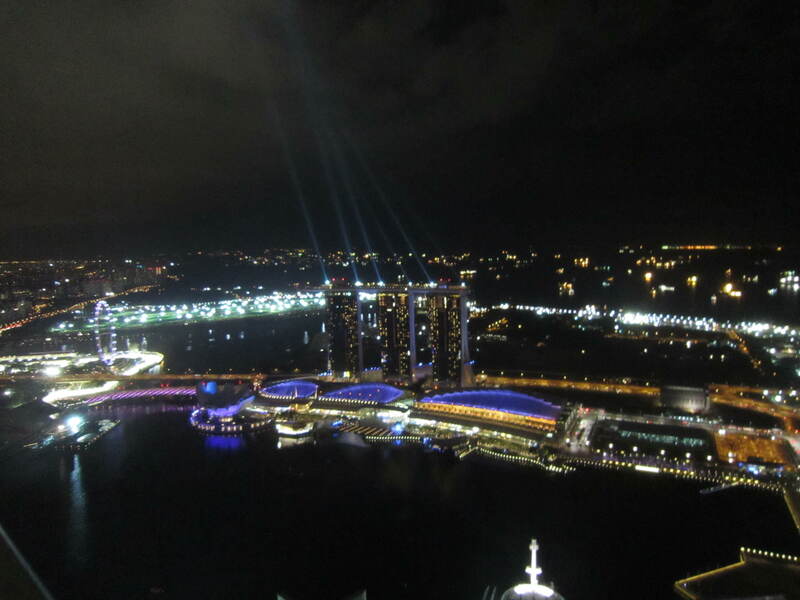 Later on in the week, Joe & I went to the top of the Marina Bay Sands hotel with Nao to Ku De Ta bar. 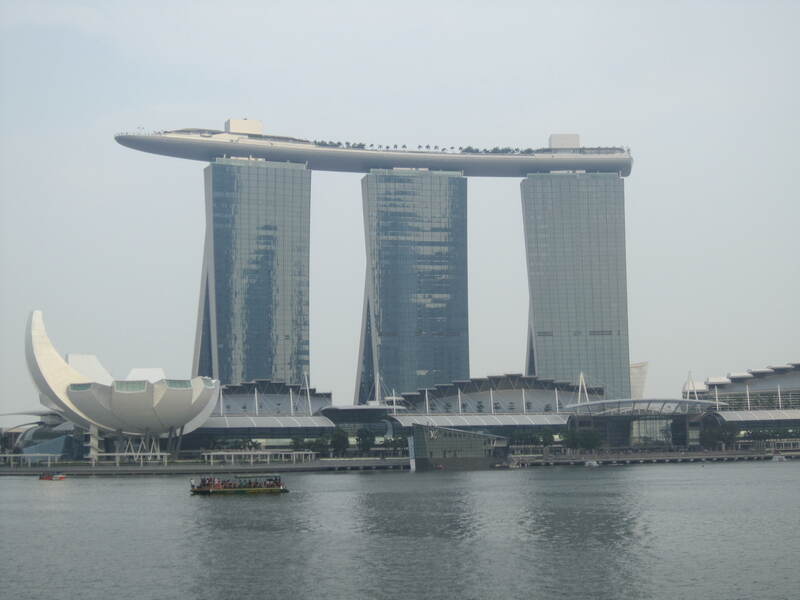 The hotel is relatively new to Singapore and it consists of 3 towers with a long boat perched on top. It is really quite impressive to see. Even more impressive that on the boat there’s not only the bar but also an infinity pool overlooking the city. Unfortunately, you can’t use the pool without staying at the hotel and the hotel goes for $400 and up a night. I wanted to stay there so badly even just for one night but my conscience (Joe) got the better of me. Maybe next time…. View from the top of the hotel - the tallest building with the bright white lights at the top was where we were a couple of nights before.